Bob Ambrogi and J. Craig Williams discuss podcasting after 13 Years, where they began, and their love for it. Back in 2005, podcasting could have been seen as a flash in the pan or the latest craze, but in 2018, podcasts are everywhere and an outlet for many. According to Edison Research‘s 2018 podcast statistics, in 2018 six million more Americans listen to podcasts weekly versus 2017! That’s impressive. 64 percent of Americans have heard of podcasts and more than twice as many Americans listen to podcasts weekly vs. watching Sunday Night Football. A far cry from 2005! On Lawyer 2 Lawyer’s 13th anniversary show, hosts Bob Ambrogi and J. Craig Williams discuss what they have learned about podcasting after 13 Years, where they began, and the art of podcasting. They take a look at how far podcasting has come and bid farewell to host Bob Ambrogi with a walk down memory lane. Bob Ambrogi: Way back when, it’s funny, I actually was looking back and I actually had found the original email that you sent me saying hey Bob, we are thinking of doing this weekly podcast, do you want to be part of it? What were you thinking back then when you got started in this? 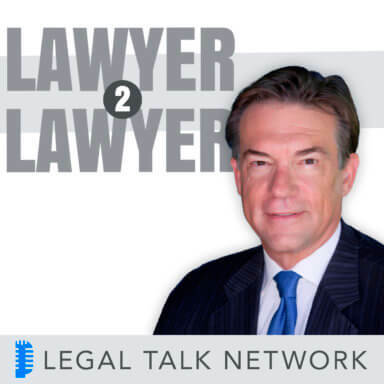 Bob Ambrogi: Welcome to Lawyer 2 Lawyer on the Legal Talk Network. I am Bob Ambrogi coming to you from outside of Boston, Massachusetts, where I write a blog called LawSites, and this is going to be my last episode of Lawyer 2 Lawyer because I am about to embark on a new podcast or a new podcast of my own called LawNext. J. Craig Williams: And this is Craig Williams coming to you from Southern California. I write a legal blog called May it Please the Court. I have a couple of books out entitled The Sled and How to Get Sued. And this is not my last podcast. We will be moving on and bringing in some guest hosts on a temporary basis until we find a permanent one after Bob’s retirement here. Bob Ambrogi: It’s probably not your last book either; we will see more of those. J. Craig Williams: Probably not. Bob Ambrogi: Well, before we start our conversation, let’s take a moment to thank our sponsor Clio. Clio’s cloud-based practice management software makes it easy to manage your law firm from intake to invoice. Try it for free at clio.com. That’s clio.com. And I should say a super big thanks to Clio, because they have been sponsoring our show for a long time and we have had a few other sponsors come and go over the Years, but I really appreciate their long-term commitment to this show. Bob Ambrogi: Not as long as we have been doing this. J. Craig Williams: No, for sure. All the way back, 13 years now to 2005, when Legal Talk Network created a weekly podcast spotlighting current legal topics, we were once known as Coast-to-Coast and after we got a cease and desist letter from the paranormal radio program and an eventual name change, we changed into Lawyer 2 Lawyer and became the longest-running legal podcast. This month we are celebrating 13 years of podcasting. Bob Ambrogi: Yeah, and not even just this month, I think it was 13 years ago this week that we recorded our first episode. It was 13 years ago this week that our first episode came out. This is the last week of August here and I think almost to the day 13 years ago that our first episode came out. I don’t remember exactly when we recorded it. But back then podcasting was a pretty new thing. A lot of people didn’t know what to make of it. Some weren’t sure if it was just a flash in the pan or the latest craze, and really over the years we have kind of seen a couple of cycles of that. There was another period of time when podcasting was really hot and then it kind of died out for a while. We kept at it. And right now it seems like podcasts are everywhere. According to Edison Research 2018 podcast statistics, 6 million more Americans listened to podcasts this year versus last year. That’s an impressive 64% of Americans have heard of podcasts and more than twice as many Americans listen to podcasts weekly versus watching Sunday Night Football. So I think what that’s saying Craig is that you and I are bigger than Tom Brady. J. Craig Williams: That may be so, but be careful there, he is a fellow Patriot. Well, from current events like the #MeToo Movement and the Trump-Kim Summit, to the legalities behind gerrymandering and the Presidential pardon power, Lawyer 2 Lawyer has virtually left no stone unturned when it comes to legal topics. Today on Lawyer 2 Lawyer though we are going to discuss what we have learned about podcasting after 13 years, where we began, the art of podcasting and take a look at how far podcasting is common, perhaps where it’s going, especially with Bob taking off and starting a new venture. Bob Ambrogi: Yeah. So as I said, I am about to — I have already actually started, I think I have got six episodes up so far of a podcast on focusing on innovation and entrepreneurship, the people who are kind of driving what’s next in law. I call it LawNext. And it’s interesting that, because we have been doing this for 13 years. We have done it always through the Legal Talk Network. The Legal Talk Network has changed dramatically since those early years in that we were really their first regular podcast; they had done a few other kind of one-off episodes here and there, but we were their first podcast, regular podcast way back then. Kate Nutting, who to this day is our producer, has been the producer of the show since, what, just a couple of months in from after we started, so she has been with us for this whole ride, but the company itself has changed hands. They have become a lot more sophisticated perhaps about all of this. So I don’t know, Craig, way back when, it’s funny, I actually was looking back and I actually had found the original email that you sent me saying, hey Bob, we are thinking of doing this weekly podcast, do you want to be part of it? What were you thinking back then when you got started in this? J. Craig Williams: Well, blogging was still relatively new and I saw it as something that was going to take off, especially with the opportunity for lawyers to be able to write and express their opinion. The book came out about the Internet has made the world flat and I really think that’s so. I mean podcasting has taken the written word a step further into the spoken word. For a while I think we toyed with the idea of becoming a video podcast, but that just never really seemed to come into fruition and there didn’t seem to be much of a call for it. Bob Ambrogi: I think it’s because somebody saw a picture of me and decided it would be better we don’t do that. J. Craig Williams: Well, we weren’t going to say that. But I saw it as a means of marketing, especially for lawyers and a way to get a little bit of notoriety in this legal world. I don’t know what kind of legal business is developed out of it for you or for me, but it certainly has been an enjoyable and really a learning experience for me to be able to listen to so many experts in so many different fields on so many different topics. It’s fulfilled my fantasies of diving deeper into what you read in the newspapers and online. Bob Ambrogi: So you started it thinking it was going to be a marketing thing, but you don’t really know, is that what you are saying, whether it really ever produced any marketing effect in your practice? J. Craig Williams: Well, I think that in large part my community has become bigger because of it. Certainly practicing in Orange County, in California and in throughout the state, it’s gotten me some cases out of the state. So I guess that that’s a thing. But I looked at it as more of a continuation of what I had started in high school, working on a TV station and a radio station and just kind of continuing in that communication field and it’s been great. It’s kept up my interest in radio broadcasting. I am still wearing headphones and I have still got a microphone in front of me like I started in ninth grade and that’s been just a blast. I really enjoyed that part of it. Bob Ambrogi: Yeah, it’s interesting. I did not — marketing wasn’t a big part of it for me. Originally when we started it was really kind of just an experiment to see what it was like, because I was hearing about podcasting and you and I were both blogging then; I think we were both blogging on the old law.com network at that point and we thought we might even get ALM or law.com involved in some way and I guess they sort of were involved a little bit for a while. But for me, I certainly never thought we would be doing it 13 years later. It was kind of an experiment. Play with it for a while. See what it was like. But like you say, probably the most rewarding part of it has been engaging in these conversations over the years, both during the podcast, but also some of the conversations that it gives rise to offline in a sense, whether on other social media or even just people you meet and run into in tradeshows or whatever who say hey, I listen to your podcast and that show you did on such-and-such was really interesting, but here’s what I think. We have had a lot of amazing people on this show over the years and it’s really been — for me the greatest learning experience has sort of underscored the idea that in some way — it goes back to the old Internet thought that marketing is a conversation and if you are engaged with people, if you are engaged in the conversation, then you are going to raise your own profile. J. Craig Williams: That’s exactly what I meant, not in the sense of like someone is going to listen to me on the radio and then all of a sudden hire me because they like my voice or what I said; it’s more of that you get the exposure on a much wider basis through podcasting than you would otherwise. Bob Ambrogi: Yeah. You have a very nice voice though, I will say that. J. Craig Williams: Well, thank you. So do you. It’s been fun to listen to you. There’s one of the questions and this is — we are going to give it up here that Kate Nutting has always been preparing scripts for us to follow and giving us the intros and the outtakes and then the interview bullets, and one of her interview bullets and this one is what we learned about how to make a podcast better? So what are your thoughts on that Bob, beyond the technical stuff that we have just done recently with Legal Talk? Bob Ambrogi: Right. The technical part is part of it and it’s funny, because as you know, I have probably sometimes complained that some of our producers and engineers have been too perfectionist. I would kind of sometimes say hey, it’s just a podcast, we don’t have to be perfect. But I can’t tell you how many times I have heard from listeners or people I meet who say they really appreciate just the overall production quality of this show that we have achieved by working with the Legal Talk Network. I mean they really do do a good job and that makes it more listenable and that makes a big difference. But beyond that, for us, there are so many different formats. I almost have to give like a lawyer’s it depends answer, because there can be different formats of podcasts. I was just listening to, Ernie Svenson just launched a podcast recently kind of giving marketing tips and he is just doing real short episodes, no more than 10 minutes an episode, he kind of just — it’s just him talking, there is no guests or anything, that works for him. What’s worked for us is having really interesting people on to talk to about timely issues and the best shows are the ones where we get two strongly divergent points of view and where those people who have those points of view are well-versed and can make cogent and interesting and passionate arguments for their positions. J. Craig Williams: We have had some people that just talk over each other and argue with each other and it just — I have listened to the podcast afterwards and I marvel at how good our engineers are at being able to segregate that stuff out. I mean realistically, we record on separate tracks, each individual on the radio, each guest and you and I are all recorded, so potentially there are four tracks running at separate times. We have got very good equipment. I have this lovely little thing called a CoughDrop that I have used since the beginning and it’s a — if I decide that I need to cough or that there’s noise outside, I can push the button and nobody hears my microphone just cut out, but it’s a wonderful piece of equipment. And we are connected by computers, we use Skype to conduct these, and I have a Shure microphone and headphones, a nice pair of headphones from Sennheiser and we do this through our computer. So I am sitting in my office, in my home office looking out over the mountains and enjoying the view, and it’s a really neat little trick to be able to do that. But I think I have to compliment the Legal Talk Network, the current, the new version of it, not the one that we started with Lu Ann Reeb and Scott Hess, but with Adam Camras and the crew that are our producers and engineers now, they have really worked hard at making sure that our equipment is clean and the microphones are good. And we do tests before each one of the podcast that our listeners don’t hear. We are on five minutes or ten minutes or so before the podcast begins and we are doing sound checks with not only the two hosts each week — or biweekly I guess. And when we do our new podcasts, we do sound checks and then we do sound checks with the individual listeners. So each person gets sound quality checked, and I think that that attention to detail really turns into a great quality podcast, and this difference is very obvious in listening to other podcasts, especially other legal podcasts, I think that ours is one of the best quality in terms of sound quality that our engineers put out. Bob Ambrogi: You have just touched on my greatest regret about the show, which is at the beginning of every show we have guests on, and as you just said, and we do the sound check and as part of the sound check we always ask them what did you have for breakfast? And I am kicking myself that for the last 13 years I haven’t kept a log of this, because I think it would really be fascinating to have a little document, put it up on a blog post, I don’t know, even a little book of what famous lawyers have had for breakfast over the years, because we have had some well-known people on here and everybody answers that question. A lot of people don’t have breakfast, but. J. Craig Williams: Coffee is I think the standard response. So you have talked about Ernie’s 10-minute podcast and our 30-minute podcast, because we have had that standard since we started, where we do a half an hour show. We are sometimes a little bit over and sometimes a little bit under, but on the average I think we hit that. I have to apologize, I haven’t listened to your new podcast, but how long is it? Bob Ambrogi: Well, it’s kind of funny, because in thinking about my new podcast, I thought I wanted it to be a little bit less than 30 minutes; we typically run 30 minutes with this show and I have always thought it’s just a little bit long, maybe 20-25 minutes would be a sweet spot. But what I am finding is when you get a really interesting person on and you start talking to them, that 20-25 minutes is tight and 30 minutes feels about right. I listen to a lot of podcasts. I listen to a lot of podcasts outside of law, and some of these people who are very popular podcasters have shows that sometimes go on for 90 minutes, two hours sometimes. I think lawyers, given that our target audience is legal professionals, I don’t think they have a lot of time to be — that much time anyway to devote to listening to a show. But so far — and my other one I have gone everywhere from 20 minutes up to 50 minutes, which I didn’t intend, but the guest was just so darn interesting, I couldn’t shut her up. J. Craig Williams: Yeah, I think the — obviously the best length is the length that a listener can tolerate listening to. J. Craig Williams: Yeah. If you stay within what a — and I think the reason that we went to 30 minutes in the very beginning was that we kind of looked at the time, about what the average commute was and that was around 30 minutes, 30-45 minutes, so we figured that if we got in that sweet spot of 30 minutes, then you get on the train, settle down or throw on your headphones or get in the car, whatever it is that your method of commute is and you have got time to listen to our podcast. Bob Ambrogi: Yeah. So should we do one of those breaks we are supposed to do every so often? J. Craig Williams: Well, 15 minutes in, but I am waiting for somebody to send me one of those messages on Skype that kind of talks in the background where we get to talk to each other and sometimes you might hear typing in our podcast and typically what’s going on is that one — and you can just kind of see me looking over at one of my other screens right now, I am looking to see if Kate’s typing anything, but she is not. So I guess I will ask you the next question which is, what’s the best frequency and I am not really sure what that word means in the respect for a podcast? Bob Ambrogi: I think frequency means how often should — should it be weekly, should it be monthly. J. Craig Williams: Yeah, I was thinking more of AM/FM and XM. No, but I mean seriously, when you think of it, and let’s go beyond just the question of the timing of it, is it every two weeks or whatever, but let me ask that question from the standpoint of, what’s the best method of delivery? I mean, do you think that us being on iTunes and in the Google Music and whatnot or wherever we are is the right place for us to be and where is your podcast available? Bob Ambrogi: Well, the best place to be is everywhere with a podcast. I mean there are a large number of podcast players out there. Ultimately they are all generally picking up the same RSS feed and putting them out through different players, so you don’t lose anything, you only gain listeners by having your podcast on as many players as you can. I mean my current favorite player on my iPhone is this little app called Overcast, because it has a cool couple of little features that let you — one of the cool features it has is you can set it to automatically eliminate any spaces between words — between sentences, so it plays a show more quickly. It sort of automatically edits out any of the quiet moments or sound free moments and it gets you through the show a little bit more quickly, and of course you can adjust the speed as well, but yeah, I mean you want to be all over the place. J. Craig Williams: So hey Bob, did you see Kate’s message that you have to interrupt yourself so that we can do the commercial? J. Craig Williams: That’s your head, there you go, tip to you. Bob Ambrogi: Well, before we move on to our next segment we are going to take a quick break to hear a message from our sponsor. J. Craig Williams: And welcome back to Lawyer 2 Lawyer. I am Craig Williams and with me is Bob Ambrogi on his last Lawyer 2 Lawyer podcast, and we are discussing what Bob and I have learned about podcasting after 13 years, and hopefully, I am asking you more questions than you are asking me because I will be here for a while. Bob Ambrogi: Well, but nobody is going to ask you. J. Craig Williams: Is your new podcast with anybody, with a group or are you on your own? Bob Ambrogi: It’s the Ambrogi Talk Network. No, it’s just me, it’s just me. I have actually enlisted my son, who has got some audio engineering experience to work with me on it, but we are doing it on our own. That’s really part of the reason I wanted to do it. While it’s been great working with the Legal Talk Network, they do all the dirty work, they do all the hard work; as you said, Kate does all the producing work, she helps us line up the guests, she outlines a script, they then go in and do all the sound editing and all of that. They have figured out the technology we need and the platforms we need and I kind of wanted to get my hands dirty a little bit with it and see what it was like to just do it myself and get a little of that much more familiar with the whole — with the medium and the technology that drives the medium. J. Craig Williams: And when you have a deep network yourself to draw from, I mean, many times you’ve suggested guests for our podcasts and Kate has gone and got some of those folks. Bob Ambrogi: Yeah, we’ve got a little work over the years but she still does most of it. J. Craig Williams: Right, so if you are the average lawyer, I mean, you’re the guy sitting in the car, you’re the lawyer sitting in the car, right now or train or bus or whatever methodology is there running or walking, listening to this podcast, why would that lawyer want to take up podcasting. What do you see is the benefits of it and why would lawyers want to do it and then we can talk about how? Bob Ambrogi: Well, again, I think the benefit is what we were talking about earlier, it’s about that — well, it it’s two things. One is it’s engaging in that conversation and that can mean any number of things but it’s the same as blogging, it’s the same as being on social media, it’s a way of engaging with an audience, with listeners. It’s also for lawyers, it is certainly a way to demonstrate your knowledge and expertise in a particular area and to reach both potential clients and existing clients with information that should be helpful to them. So, it’s very good — it’s a good marketing tool. I don’t know, I’m undecided on whether it’s — I don’t think it’s as effective a marketing tool I’d say blogging. I think you can much more quickly get a much bigger reach through a blog. It’s a lot of work getting a podcast out to an audience. We’ve been very lucky with this podcast because we’ve been doing it a long time and when we started doing it, there weren’t a lot of podcasts out there. So, it was probably a little easier for us to build up reach and the Legal Talk Network has told us over the years that we’re either their top or always in — among their top downloaded shows and that’s taken a while to get to that. And so, for a lawyer launching a podcast probably one of the biggest challenges is going to be that, it’s going to be building up an audience and getting people to listen to it. J. Craig Williams: So, who do you see as our competitors and what do you listen to? Bob Ambrogi: Well, I mean, it’s funny again, just since we’ve — since I’ve launched my own podcast and I don’t know if it’s that that syndrome of you go out and buy a Volkswagen and suddenly you’re seeing Volkswagens everywhere you turn, but there has been a surge of people starting podcasts lately and a lot of really good ones out there. I’m not sure even where I’d start to go down the list, but I mean, the Legal Talk Network itself has always had a lot of good podcasts but there are a number of them launching in the legal area. I happened to like the three geeks and the law blog guys have been doing, they’ve got a long-standing blog and they’ve recently started a podcast that I really like. So, I don’t know about you, what do you listen to? J. Craig Williams: I’m pretty much up and down the Legal Talk Network, I’m solely listening to the ones that are on our group. J. Craig Williams: Mostly Tom Mighell I would say. Bob Ambrogi: Yeah, I listen to a lot of non-law podcasts and as a matter of fact I probably listen to a lot more non-law podcasts than I do legal podcasts and probably just because a lot of times when I’m listening to podcasts, it’s when I’m exercising or driving or something and I kind of want more of a brain break from legal stuff. So, that’s what I find myself doing. J. Craig Williams: So, what would you say is your take-away from your time here? Bob Ambrogi: Wow. I mean, the take-away ultimately ends up being the people as with kind of anything in life. I mean, you mentioned the people who originally started the Legal Talk Network Lu Ann Reeb and Scott Hess and although it was a few years ago that they sold off the company. They’ve become lifelong friends, and of course, Kate, who we mentioned is — Kate is not just a producer, she’s part of our — it’s like a family. J. Craig Williams: It’s a family, yeah, exactly. Bob Ambrogi: And since the current team of I think that the company LAWgical and which is actually the company that owns Legal Talk Network. I mean, all the folks there from Adam Camras, who is the CEO and Trent Carlyle, who is the CTO, and our ace Executive Producer, Laurence Colletti, it’s the same thing. I mean, the kind of friendships we’ve had out of this and some of the guests we’ve had over the years have sort of become friends and returned guests, Lawrence Savell went to the trouble of creating a song for us at some point, the lawyer who likes to sort of has a little recording studio in his house and used to put out holiday albums every year and we’d have him on every year at Holiday time to play us his latest holiday hits album. But he actually went to the trouble of creating a little theme song for us, which we haven’t used, but it’s a wonderful little song. J. Craig Williams: Yeah, Steven Kaplan is a friend of mine from Newport Beach — from Laguna Beach and he’s been on a number of years to do predictions for us, that was a lot of fun. Bob Ambrogi: Yeah, I sat down, this is a little bit — I don’t know, obsessive-compulsive of me or something. I was trying to figure out exactly how many episodes we did of this show and I have — my number is and I may be a little off on this, but I’ve got 586 episodes over the years. J. Craig Williams: That’s a lot. Bob Ambrogi: That’s a lot, and there were a lot of good people on the show over the years, a lot of good stuff. J. Craig Williams: Let’s draw from that, what’s your favorite moment out of all of those 586 podcasts that we’ve been doing together. Not all of them, you and I have done together, some of them you’ve done independently and I’ve done independently as our schedules have gotten in the way, which has been an interesting kind of thing to watch the show go through, but what’s your favorite memory? Bob Ambrogi: My favorite memory, and unfortunately, you were not there for this one, Craig, was the show we did live in Denver, Colorado at the Legal Talk Network studio which happens to be adjacent to a brewery and there’s a group of people — a group of lawyers out in Denver who do their own podcast called FOSS+beer, FOSS standing for free and Open Source Software. And every episode of their podcast they talk about the law around Open Source Software and they also talk about craft beer, and they make a point of making sure they consume craft beer during there. J. Craig Williams: So, were you drinking while podcasting? Bob Ambrogi: So, well, we were not only drinking while podcasting but we were drinking in advance of podcasting. We all got a big table. Laurence was there setting up microphones all around the table and we had their crew there, we had pretty much a whole bunch of the Legal Talk Network crew there, we invited the brewmaster over to join us at some point. And I think by the time we hit that Record button, we had already consumed a few beers and it made for a very fun conversation. J. Craig Williams: That’s great. I’ll have to go back and listen to that one. I think I did. Bob Ambrogi: And one of our guests on that show was Boups the Beerman. Bob Ambrogi: No, B-O-U-P-S, Boups the Beerman. J. Craig Williams: Boups the Beerman. Bob Ambrogi: Never quite figure out exactly who he was. How about you? J. Craig Williams: Pretty much the same thing, but even longer back — farther back than that. I went to the Legal Talk Network studio in Norwalk, outside of Boston, Massachusetts. J. Craig Williams: Norwood right, Norwood and right next to the airport, and sat down in this studio and was just amazed at the level of the — and the quality of the equipment that Scott Lu Ann had for recording. Having worked in radio for a number of years myself I could appreciate it and it was wonderful to sit down and do a show in the studio. Although, I don’t think that there was any drinking involved. I’ll have to reconsider that one the next time I get to Denver. Bob Ambrogi: Yeah, if you go to Denver. J. Craig Williams: I love to ski, so I’m going to make it a point, I guess. So I’m supposed to give you my favorite Bob moment and I will tell you that I thought long and hard about this, so be ready, because I’ve had a couple of days to ruminate on this script and Kate and I have exchanged some emails about it. But I would have to say that my favorite Bob moment is kind of a continuous one and I’ve commented to you about it frequently when we’ve been off-air or before or after the show, I enjoy your style of questioning. I know that you’re — one of your credentials is that you were the editor of the ‘National Law Journal’ and you don’t get to that position not having slugged it out in a newsroom, and understanding what it is you’re asking. And I have — I share somewhat of a similar background from and understand that kind of a concept. But one of the things I love about having you in the shows and listening to you is that you ask the most precise questions and the questions like I want to know the answers to. Because you are asking the newspaper-style question and every time you ask those questions I kind of have this image of something out of Robert Redford’s journalist movies, where you’re sitting there in the newsroom and a bunch of reporters are around you and you’re handing out assignments and you’re looking at the people going out, make sure you ask these questions because this is what people want to know. And as I listen to you, asking your questions, the who, what, why, how, when and establish basically the lede of the story, your style of questioning is really enjoyable and I have enjoyed that throughout the years and it’s probably one of my favorite parts of the show. Bob Ambrogi: Well, I think that’s funny that you say that because, I mean, I would say the same thing about you. It’s funny because one of the debates I’ve always had in my own mind, is whether the two hosts format versus the one host format is better, and I’ll concede that there have been times when you’ve asked a question that it kind of irritated me, it’s like why in the world is he asking that question because it’s — it seemed almost off-kilter or something to where I thought the conversation was going and then I’d hear the answer and then I’d realize that it was brilliant that what you asked. And it’s a big part of what made — I think what made the show interesting is that I think our questioning styles were not always perfectly in balance and that’s what kept the show interesting all the time, that if it was one person asking the questions and you get a certain monotony to it. And if you’ve got two persons asking the questions, two people asking the questions, then you never quite know where it’s going to go. And I don’t know, you don’t know, and the guests don’t know, and it keeps everybody on their toes a little bit, makes it a lot more interesting, I think. And you’ve always had that sort of if you say that I had a sort of a journalistic approach, you always had the sort of trial lawyer approach to it. I felt like — I sometimes felt like there was a cross-examination going on here on the other end of the Skype line and I’m sure that some of the guests felt that way for sure that they were on the hot seat at times. So it’s great that we kind of both appreciated each other’s styles of questioning over the years. J. Craig Williams: — that you don’t really are thinking up at the time. Bob Ambrogi: So, what’s next for Lawyer 2 Lawyer, are you going to reveal the next steps for Lawyer 2 Lawyer? Bob Ambrogi: Robert Mueller, we have consulted with them. J. Craig Williams: Exactly, and so we’re going to continue on. We’re going to bring on a series of guests/hosts for a period of time and kind of ask our listeners to get involved and help us choose and vote maybe or at least kind of see where the synergies lie, and then after a period of time we’ll pick a co-host and off we go into The Wild Blue Yonder. We are going to change some of the format of the show. I think we’re going to add kind of a — I’m going to say a Call a Friend option kind of thing where we’re going to have one or two maybe three go-to guests and then you probably are going to know who they are. We’ll probably talk to people like Erwin Chemerinsky and John Eastman. It’s just kind of like two-thirds of the way into the discussion, we’ll probably get somebody on the phone and say, look, here’s the current discussion and this is what we’re talking about, give us a quick thought and drop a hand grenade into the conversation and then finish out the podcast with the third-party input, but a very brief input so that we get kind of — go for a lifeline kind of thing like in the Cash Cab where you can roll down the window and ask somebody on the street, what’s your thought and throw a conversation in a different direction and bring something into it that hadn’t been thought of or brought in before because our guests have as you have very rightly pointed out been the leaders in their industry and we have brilliant people, brilliant jurists, brilliant attorneys, and those are resources that we don’t really want to lose. So we’re going to try and tap into that a little bit more. Bob Ambrogi: So, it’s sort of like when Regis Philbin left and Kelly Ripa had to try out co-host for a while. J. Craig Williams: We were thinking Ryan Seacrest and he was busy and then we tried Michael Strahan, but he’s got way too much going on. So, we’re going to be looking around and calling up some friends and taking tapes of people that want to try out. I say “tapes” but nowadays it’s give us a voice recording on your phone, and let us know, because we’re out there taking a look. J. Craig Williams: And Bob, do you have any suggestions, maybe I got to throw that one to you, who would you see as your replacement? Bob Ambrogi: I don’t know, I don’t have any suggestions. I think I did actually suggest a couple of people to Adam. At some point Adam or Laurence at some point, but I forget what I said. J. Craig Williams: All right. Well, we’ll keep those under wraps right now. Bob Ambrogi: If I didn’t already. J. Craig Williams: Great. Well, anyway, and then we will finish up with what’s next for you. Bob Ambrogi: You know the other funny thing? It’s one other funny note. I just think it’s kind of funny that over the 13 years that we’ve been doing this show together how many times have we ever actually physically met each other, two or three? J. Craig Williams: Once… two or three times. Bob Ambrogi: Once or two maybe. J. Craig Williams: Once or two or three times. Yeah, I mean, I know who you are because I’ve seen you and having been born and raised in Massachusetts myself I kind of understand part of the way you think based on geography. Bob Ambrogi: I think cold. J. Craig Williams: Yeah, we haven’t met that much. Bob Ambrogi: So, I’m going to be out in LA in next month, so let’s have a drink. J. Craig Williams: Yeah, let’s have a drink. Maybe we’ll do a podcast again. J. Craig Williams: Drinking while podcasting. J. Craig Williams: That sounds like a fun title. Anyway, let’s go on to what’s next for Bob. This is your opportunity to plug LawNext where our listeners can find it and enjoy you on your own doing your podcasts, and so lay it out there. Bob Ambrogi: Yeah. So LawNext, you can find it at lawnext.com. You can find it in the Apple Podcast Store. You can find that over at my blog lawsitesblog.com. Just Google it LawNext, I’ve got the podcast, I’ve got the domain name, and it’s out there, you can find it. J. Craig Williams: Well, let us know if you get a cease and desist letter. J. Craig Williams: All right. Well, Bob, it’s been fun, it’s been a great 13 years. I look forward to like you say remaining lifelong friends. This is a growing big ever-changing family on this, on the Legal Talk Network and especially on Lawyer 2 Lawyer and I’ve loved doing podcasts with you, and I’m sure it’s over 500 that we’ve done together, and I really do want to thank you for being such a big part of it. Bob Ambrogi: Yeah, well, thank you. Thank you for getting me involved in the first place way back when and it’s been a real pleasure to get to know you and real honor to be part of all the folks behind the scenes and in front of the mic at the Legal Talk Network, so I’ll miss you all. J. Craig Williams: Yeah, and I’m really glad that we’re going out best of friends instead of having the kind of drama that goes on in the any entertainment industry. Although, I’m still looking for my Hollywood star. Bob Ambrogi: Yeah, yeah, keep looking. J. Craig Williams: Yeah, I know, never going to happen. Anyway, so Bob, you get the last word. Here you go. Bob Ambrogi: All right. That brings us to the end of this show. If you liked what you heard today, please rate Craig in Apple Podcasts, and you can also visit Craig at legaltalknetwork.com, where you can leave a comment on today’s show, and sign up for Craig’s newsletter, not our newsletter. And this is Bob Ambrogi, signing off for the last time. Thanks for listening. Don’t join me next time, but join Craig next time for another great legal topic. When you want legal, think Lawyer 2 Lawyer. J. Craig Williams: Thanks Bob. Bob Ambrogi: Welcome to Lawyer 2 Lawyer on the Legal Talk Network. This is Bob Ambrogi from Massachusetts where I write a blog called LawSites, and that’s all I do. And that’s all I do now. And this is my — should we start that over again or should we just keep this all in here? It doesn’t matter. J. Craig Williams: Oh my god. Bob Ambrogi: I think we should just give this.